Two college students were sitting on the couch in the living room of their shared Dublin apartment in May when their servers crashed. About a week earlier, the duo had launched a free tool that automatically transcribes audio files. Though local researchers and doctoral candidates making an end-of-semester sprint made up most of its user base, another group of people had just heard about it: journalists. Marc Assens and Andre Bastié opened Google Analytics to find that, instead of the usual 70 visitors per day, there were thousands. And instead of five or six files in the transcription queue, the list had ballooned to nearly 100. Scribe, now known has Happy Scribe because of a snafu with the company’s incorporation papers, has transformed since that day on May 4. After an article published on Poynter.org sent them an unexpected wave of users, Assens and Bastié met with professors for guidance and joined the incubation program at Dublin City University. They began charging nine cents (in Euros) for each minute of transcribed audio to cover their expenses, an amount they claim is a third the price of their competitors. They added more file types, made the website responsive, gave the interface a facelift and honed the algorithm (built on Google’s Cloud Speech API) to make transcription more accurate, an effort they say is ongoing. Initial additions included better punctuation, capitalization and paragraphing. They just added a new text editor with timestamps, which highlights parts of the transcript as the user plays back audio. The duo is now working on proper nouns and teaching the algorithm to look not just at words and sentences, but at the entire conversation. Most importantly, they’ve rebuilt the site’s architecture to handle up to a thousand concurrent users. Working with journalists has been “super interesting,” Bastié said. After adding a help-chat feature to the site, the duo fielded questions about privacy and security and added a small section on their site to address them. I used Happy Scribe to transcribe my interview with Assens and Bastié, which I recorded with Google Hangouts on Air. It worked for my parts of our conversation nearly flawlessly but struggled with their accents (they warn users to “be careful with heavy accent” on their landing page). Still, it captured the gist of their speech enough to keep me from having to scribble notes throughout the interview. 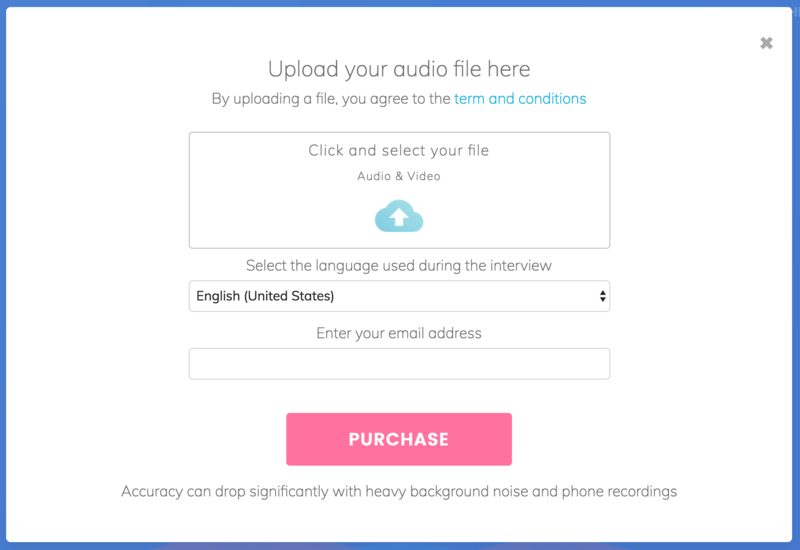 After recording the conversation, I uploaded the video file to the Happy Scribe website (the tool accepts multiple audio and video file types) and selected U.S. English as my language. Then, I entered my email address and paid about $3 to transcribe 30 minutes securely through Stripe. It takes Happy Scribe about half the total time of the uploaded audio file to transcribe it — so a one-hour audio file will take about 30 minutes. Happy Scribe works with longer audio files but may still be buggy for files longer than 80 minutes. Assens and Bastié are working on that, but it may be wise to split long audio files in the meantime. When the transcript is ready, Happy Scribe emails a link to the address the user entered when the file was uploaded (there are no accounts yet). The link leads to a page with an editable transcript with basic word processing features, a playable version of the uploaded file, keyboard-based shortcuts to play the file at various speeds or rewind/fast forward and options to save or delete the transcript and file. Assens and Bastié were just selected to join the Ireland Fund Business Plan Competition, which helps young technology startups grow. They were invited by the French ambassador to Ireland to present Scribe at the embassy and, later this year, will move to Barcelona, where Bastié will work full-time on Scribe while Assens pursues his master’s degree. Happy Scribe is a useful tool for journalists, especially with the knowledge that it comes from two students looking for a workaround to transcribing a dozen interviews with Irish entrepreneurs.